“Throughout the year we produce 12 different menus every day, so we meet the specific nutritional needs of the clients," stated Craig Shinderman, The Director of Food & Friends' in Washington, D.C. "But Thanksgiving is an All-American Holiday and people really like turkey, stuffing, greens, mashed potatoes, cranberry sauce, rolls, pumpkin pies. We provide the whole nine yards, thousands and thousands of pounds of food." In fact--8,400 pounds of turkey, 975 pounds of cornbread stuffing, 1,050 pounds of mashed potatoes and 2,600 dinner rolls. A meal that could not be provided without the thousands of volunteers whom give their free time to help out those in need. These Hometown Heroes as Mr. Shinderman calls them that on Monday, November 23rd, included nearly 30 Front Office Staff of Our Washington Nationals, along with Pitcher Craig Stammen. Two teams that worked two shifts at Food & Friends'. The first of four labor intensive days involved in the cooking, preparing and packaging of nearly 3500 Thanksgiving Dinners that will be delivered this Thursday Morning. “This is a chance to help some people out here who are less fortunate and are not in position to have that typical Thanksgiving--like so many others are accustomed to," said Craig Stammen. "So, it’s very nice to be here and give them a helping hand—and give them some good food to eat as well. I am accustomed to growing up in a big farm community where everybody pretty much does their own thing. So, living in the city (now), has exposed me to what’s not perfect in the world." Food & Friends' formed in 1988 to serve those suffering from HIV/Aids, but now has grown to also help those with cancer and life-threatening illnesses. 1/3rd of Food & Friends' $8 Million Dollar annual budget comes from local, state and federal funding. The remainder from generous contributions from corporations, foundations and The United Way. In September 2008, former Washington Redskins Coach Joe Gibbs came to Food & Friends' with his NASCAR Driver--Denny Hamlin--as part of FedEx Cares Day. "Of course, it didn’t spark my NASCAR career!" laughed Craig Shinderman, "I am still driving my Ford Truck. But they did give us a Toyota Prius for the organization. And Coach Gibbs made a very generous personal contribution that was not originally in the plans. I think he was very touched by the experience." Joe Gibbs getting that belonging feeling that comes from giving ones self today--so others may lead a better life tomorrow. Marla Lerner Tanenbaum: "We’ve been supporters for many years. The motivation for our gift was my mother (Annette Lerner) recalling how she made chicken soup for a dear friend of hers who was dying of AIDs. This was many years ago and my mother was struck by how nourishing the soup was to his soul and spirit. So, when a good friend asked me to participate (as a board member), the memory of that incident came to mind. It’s a great organization; it does such meaningful and important work and it’s run by smart people who respond to the community’s needs." Just outside Food & Friends' main door is a garden endowed by The Lerner Family. As Nationals Staff helped prepare the turkeys, sorted canned and baking goods, poured soup into protective containers and wrapped meals--they were joined on Monday by other volunteers from Capital One's Main Headquarters in Tyson's Corner, Virginia and students from Penn State. In a typical year, nearly 11,000 volunteers will assist the 50 staff members of Food & Friends'. Six days a week, meals are prepared and delivered to their nearly 3000 clients. This week, the nearly 3500 meals to be sent out for the Holiday Feast, will be assisted by over 800 volunteers. "We simply wouldn't be able to do this without the volunteers," believes Shinderman. "The volunteers are critical. With only 50 on staff, we would never be able to deliver over 1 million meals in 2009. Every day people are the celebrities here every day, and especially on Thanksgiving. The 800 people that are here today, tomorrow, Wednesday and Thursday--we applaud them as they are leaving the building carrying their deliveries. These people always look shocked as every day people are rarely treated as celebrities. But for us—they are our Hometown Heroes." Final preparations in Food & Friends' Kitchen will begin at 4AM Thanksgiving Morning. Just a few hours later, those many Hometown Heroes will be out on the streets of 14 counties and cities in Maryland, Virginia and District Of Columbia delivering that All-American Family Holiday Meal. Volunteers like members from Our Washington Nationals Family, whom gave a few hours of their time Monday in N.E. Washington so those with HIV/Aids, Cancer and Life Threatening illnesses can spend more time peacefully, and happily, with their families on Thanksgiving Day. Late in October, Our Washington Nationals Ryan Zimmerman was nominated for The All Stars Helping Kids Award as one of 53 athletes across this country helping out in the surrounding community's they live and work. 10 Winners to be placed on The Dream Team Of Public Service. This afternoon, Ryan Zimmerman was awarded a deserved spot on that Dream Team. The Z-Man to be officially recognized in New York City at the third annual Sports Business and Philanthropy Luncheon on Tuesday, December 8. Then, next June 22nd, he will be on hand at The Jefferson Awards For Public Service--right here in The Nation's Capital--where two Dream Team Members will be honored with the very prestigious Jefferson Award--given to those who have given their heart and passion, selflessly, to others in need. Ryan Zimmerman Rewarded For Making A Difference. SAN FRANCISCO (November 23, 2009) – Detroit Tigers outfielder Curtis Granderson and Washington Nationals third baseman Ryan Zimmerman are among 10 “Dream Team for Public Service” winners from among 53 nominees selected for the Jefferson Awards for Public Service, which will recognize the top athletes who have given back to their community. Ronnie Lott, NFL Hall of Famer and founder of All Stars Helping Kids, today announced the winners, who will will be officially recognized in New York City at the third annual Sports Business and Philanthropy Luncheon on Tuesday, December 8. In addition, two top winners will be honored at the national Jefferson Awards ceremony June 22nd in Washington, D.C. Past Jefferson Awards winners include four Supreme Court Justices, seven Secretaries of State; as well as Oprah Winfrey, Alan Greenspan, Peyton Manning, Colin Powell, Lance Armstrong, Barbara Bush and Bill and Melinda Gates. Teams from across the sports world nominated 53 athletes from 10 sports, with each athlete having a track record of community outreach as well as a sincere passion for service. Fan voting was conducted online or via text message, with over 25,000 votes logged during the process. Since 1989, All Stars Helping Kids has been a galvanizing force and vehicle for individuals and corporate partners to invest in the future of children in the San Francisco Bay Area and beyond. All Stars Helping Kids’ mission is to promote a safe, healthy, rigorous learning environment for disadvantaged children in low-income communities. Since the recession hit The United States a few years ago, both Lehman Brothers and Corus Bank have fallen. 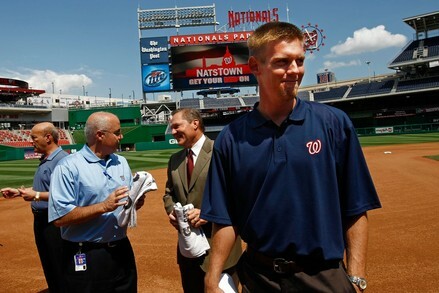 It just so happens both were also major investors in The Ballpark District surrounding Nationals Park. The Huffington Post released this past Friday a well produced story describing The Ballpark District's languishing re-development prospects. Specifically, the story looks at The Half Street Project of Monument Realty--their 55 M Street, S.E. building now erected above the West Entrance to the Navy Yard Metro Station and the accompanying open pit that exists on the east of Half Street, S.E. as one exits the Metro Station and walks toward Center Field Gate at the ballpark. Don't expect a whole lot more anytime soon, sadly. The economy is still lagging, commercial real estate is taking a big hit, and banks are nowhere close to lending out dollars as they were five years ago. A few more years are going to pass before The Ballpark District success can be reached. It took 10 years for the Chinatown area surrounding Verizon Center (originally called MCI) to totally take shape. Eight more years for South Capitol Street, Half Street, Potomac Avenue, 1st Street, M Street and N Street--all in S.E.--to catch up with Nationals Park--probably not out of the question either. The Washington Redskins Jason Campbell, The New York Jets Mark Sanchez (although his injury occurred his senior year at USC), The Los Angeles Lakers Andrew Bynum and The Arizona Diamondbacks Chad Qualls--fortunate all to be professional athletes. All of whom not so fortunate to share another experience with Our Washington Nationals Stephen Strasburg. The moving, or sliding, of the triangle shaped bone covering the knee (patella) out of place. This injury occurs frequently in sports when an athlete makes a sharp turn or move on the field of play in an opposite direction. If no bone is broken or cartilage damaged--no surgery is required. Immobilization for three to six weeks in a brace follows, which allows the body to mend naturally. Physical Therapy after that. That is the diagnosis for Stephen Strasburg announced yesterday by Our Washington Nationals. The same treatment received by Campbell, Sanchez and Bynum for their dislocated kneecaps. All three followed a similar course back to recovery now recommended to Strasburg. Today, all three of those players are fully healthy and back playing, and starting, for their respective teams. Qualls' injury, on the other hand, was more serious and required surgery. The Snakes Closer took a line drive off his left knee in an August 31st game. Test showed ligaments were damaged. Three to four months recovery required to get back into the game--after being placed on the operating table. What is unclear is whether Chad Qualls will be 100% ready come Spring Training--2010? Qualls needs to heal, rebuild his strength, flexibility--and his confidence that he can pitch again without pain. Heavy therapy with the mind games thrown-in. Worry that Strasburg has dodged for now. No injury is ever good, but as Our General Manager Mike Rizzo stated last night: "It was the best result that we could have hoped for," when Dr. Lewis Yocum in Los Angeles gave Washington his expert opinion on Strasburg's dislocated knee. Rizzo's comment was right on target, because ligament damage would have been far, far worse. If surgery had been the case, everyone would begin wondering whether Stephen Strasburg's surgically repaired left kneecap would affect his plant foot, his delivery and, ultimately, his 100 MPH Fastball? No one wanted to see that. Especially any injury that might change his pitching mechanics--and hinder some of that God-Given special talent Stephen naturally possesses. Just look at the history of Hall Of Fame Pitcher Dizzy Dean and how a freak injury turned his career around--for the worse. You never want to minimize any damage. And you never want to take chances with top talent. Yes, Stephen Strasburg and Our Washington Nationals received some fortunate news yesterday. But everyone is still going to have to proceed slowly and watch Strasburg closely. Remember, to this day, Mark Sanchez stills wears a protective brace on his right kneecap--as a precaution. Coming through Immigration & Customs at Dulles International Airport overnight, the I.C.E Agent notices my Red Curly "W" Cap on top of my head. "You a Nats Fan?" he asked. "Yeah, Big Time," I respond. "Just read during my break that Stephen Strasburg hurt his knee in Arizona shagging flies during batting practice," the agent continues. Me: "Great, not the best thing to hear returning home." AGENT: "No, but Welcome Back to the United States though." Walking around Nationals Park yesterday with virtually no one in sight was quite fun. Sohna and I took The Ballpark Tour, with Les as our guide, beginning at 10:30AM Friday Morning. There were just two other fans along for the ride. Each Season Ticket Holder was given "X" number of free passes from the just completed 2009 season. We hadn't used ours yet, so yesterday was our day. Damp and rainy weather during the entire 90-plus minutes inside Nationals Park didn't damper the spirits. In fact, it enhanced the outing and gave the entire experience that personal feel. Throughout the entire time walking around, we only ran into four other employees at Nationals Park. Meeting at Center Field Plaza, Les started everything off by talking about the three statues of Washington Baseball Greats, then we proceeded clockwise around the main concourse, The Exxon Kids Zone, The Painted Columns of Historical Players, The Kravitz "The Ball Game" Mobile, and then on to The PNC Diamond Club where Les told the story of how The Washington Senators scored the game winning run in Game 7 of the 1924 World Series at Old Griffith Stadium. The Line Score to D.C.'s only World Series Winning Game, the backdrop to the bar inside Diamond Club. Everybody enjoyed looking at one of the electronic modules used in the HDTV Scoreboard which was presented by Les. The Presidential Suites behind home plate were also on the agenda. Then, upstairs we all headed to The Stars & Stripes Club. Our Home Away from home during the baseball season as we sit in Section 218 there. Sure enough, part of the tour headed toward our section and the Homestead Grays Bar. From there, up three more levels to the sixth floor and the Shirley Povich Media Center. A nice view from the Press Box, despite the pouring rain. And a good look at the wonderful Shirley Povich artifacts displayed in the elevator lobby there. Some really nice historical items in that display case. Les then took all four of us downstairs to The Lexus Presidents Club--where it was raining so hard--there no way any of us were heading out onto the veranda for the view. So instead of spending a lot of time there, we headed over to Our Washington Nationals Clubhouse to peek inside. And then walked down the stairs to the home dugout. At this point, the downpour was so thick, the field was hidden behind this gray mist. A little eerie, but became better when The HDTV Video Board started playing a special presentation about Ryan Zimmerman winning the 2009 Rawlings Gold Glove and the 2009 Louisville Silver Slugger Award this past week. All accompanied by a series of Flaming "Z's" dancing across the ribbon boards at Nationals Park. Finally, we ended our trip around Nationals Park in Washington's Rightfield Bullpen, where everyone got the opportunity to take a few throws from the mound. Since only four of us were there, we each got four tosses. The small group provided a nice opportunity for banter and storytelling, that back and forth which baseball fans always love. Even Les was into the camaraderie of it all. The casual and intimate atmosphere making this visit well worth our time. The Ballpark Tour, a nice outing for fans during the off-season looking for their baseball fix.